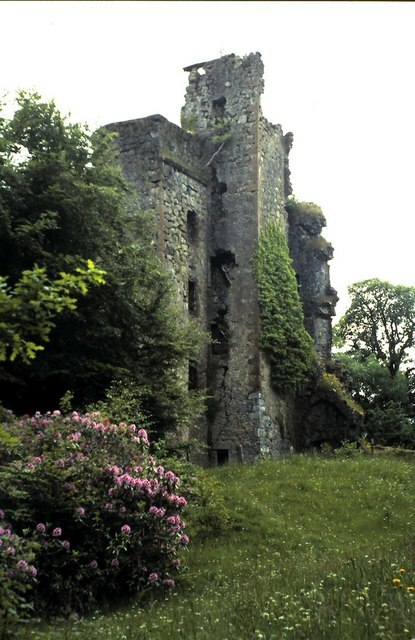 Notes: Invergarry Castle in the Scottish Highlands was the seat of the Chiefs of the Clan MacDonnell of Glengarry, a powerful branch of the Clan Donald. The castle's position overlooking Loch Oich on Creagan an Fhithich - the Raven's Rock - in the Great Glen, was a strategic one in the days of clan warfare. It is not certain when the first structure was erected on Creagan an Fhithich but there are at least two sites prior to the present castle. After raids by the Clan Mackenzie in 1602 which included the burning of Strome Castle, the MacDonalds of Glengarry fortified the Rock of the Raven. The result was an imposing six storey L-plan tower house. According to clan tradition, the castle was built with stones passed hand to hand by a chain of clansmen from the mountain Ben Tee. The present structure was designed on the "L" plan, with a round tower at the north-east angle. The main building rose to five stories and the tower to six stories in height. The main building measured 55 by 32 ft. The hall, on the first floor, measured 44 by 20 feet. The main entrance was in the north wall of the wing of the castle. There are shot holes used to guard the main door and there are also shot holes under the staircases and in the walls of the tower. During the Civil War Oliver Cromwell's troops under General Monck burned the castle down in 1654. Repaired, it was held for King James VII of Scotland from 1688 until its surrender to the Government forces of William and Mary in 1692. It was then held by the Jacobites during the 1715 uprising, but taken for the government in 1716. During the 1745 uprising it was again held by Jacobites and visited twice by Bonnie Prince Charlie. During the Jacobite Risings of 1745 to 1746, Prince Charles Edward Stuart - "Bonnie Prince Charlie" - visited the Castle shortly after the raising of the Royal Standard at Glenfinnan and is said to have rested there after his defeat at the Battle of Culloden, in 1746. In the aftermath of Culloden it was sacked and partially blown up by troops under "Butcher Cumberland" as part of his systematic suppression of the Highlands. However the stout walls refused to yield and have survived the centuries to serve as a reminder to their glorious past. The Glengarry estates were sold by Aeneas Ranaldson MacDonell of Glengarry, the son of Alexander Ranaldson MacDonell of Glengarry (1771-1828), when he came of age, but he retained Invergarry Castle, Invergarry House, the "Well of Heads" and the ancient clan burial ground, which instead passed through Aeneas's daughter to the Erskine Cuninghames of Balgownie and Corrie, transferred in 1960 to the National Trust for Scotland. Today there is a nearby mansion called Glengarry Castle Hotel. In 1960 Invergarry House was reborn as the Glengarry Castle Hotel. It enjoys an enviable position overlooking Loch Oich, with the added attraction of the ruins of Invergarry Castle in the grounds.